Country band Old Dominion will bring their growing collection of No. 1 hits to the Main Stage on Friday, Aug. 9. 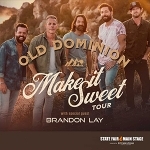 Old Dominion burst onto the country music scene in 2015 with their smash single “Break Up With Him”, but members of the group had found success long before then, penning hit songs for Kenny Chesney, Luke Bryan, The Band Perry and many more. Old Dominion has since established themselves as one of country music’s biggest acts, recently headlining their first-ever world tour and winning Vocal Group of the Year at the 2018 American Country Awards. Country/rock singer-songwriter Brandon Lay will open the 7:30 p.m. show. All track level tickets for Old Dominion will be general admission, with reserved seating beginning in the lower grandstand. Tickets will be $59, $49 and $39.